This is it. Sunday, April 19, 2009 is the 25th Annual Vancouver Sun Run. I am running, along with my mother, my brothers Wesley and Jordan, and I think my friend Emily might even come out for it. I’m also hoping my sister-in-law Alex will come out to cheer us on, and maybe snap a photo or two??? If you’ve been keeping up with my blog posts, you’ll know that Jordan, Wesley, and I are also raising money for charity. You’ll see my page here, Jordan’s page here, and Wesley – well, he’s being a little bit secretive about his total. My brothers seem to think that I am going to kick their butts (we had a very funny conversation about it before Easter dinner on Monday), but I’m not sure. I know that these guys can push it when they want to. They say they are out of shape and haven’t had enough time to prepare, but I’ve seen Jordan pull a 10ker and even a triathalon out of his hat, with little to no training beforehand, so we’ll see. Wes has been training, but hasn’t quite made to the 10km mark yet. My Mom… well, I’m not worried about her. She can do a 10km run in her sleep, and come in at a decent time of 55 minutes. Look at her, isn’t she cute? She’s twice my age, too. She is my inspiration. She never even use to exercise when she was a teenager, or even when she was in her twenties! But after having 3 kids, she wanted to start doing something, so she slowly started running and walking a few laps around the track (we lived literally steps away from one at the time), and now look at her! 17 Vancouver Sun Runs under her belt! That’s dedication. As for me, I normally keep up with my running and I have been training quite hard, except the last 2 weeks have seen a bit of a lag. I’m still running, just not as consistently. I’m not sure if it has been appropriate timing to slow down with the training or not. We’ll see on Sunday, I guess. Good luck, everyone! Thanks, Alex! No matter what happens, it’s going to be fun. I still can’t believe that I convinced these guys to do it with me. Hey! teh new theme looks good, except I’m not fond of how it’s not centered on the page. On my big monitor, it takes up ony the left half of what I can see. Maybe take a look at a new theme they have now called “vigilance.” It will let you set a LOT of the theme’s color choices, so it won’t look too much like mine or the BurnabyBlog. 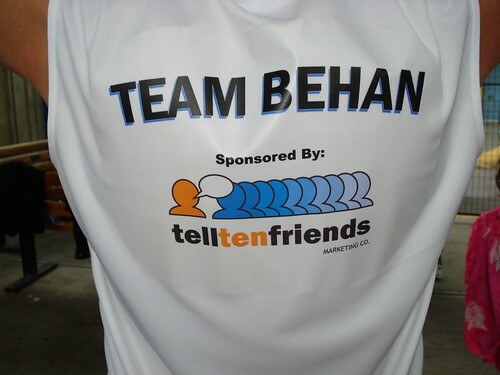 Also- I packed away my Team Behan shirt! Can’t find it! Boo.